Elephants are the largest animals on Earth, and they love to engage in big fun. Elephants can live 60 to 70 years, and they develop deep and remarkably close bonds with their families. With a lifespan that long and close social ties, this means lots of time for fun and closeness. Just like people, elephants love to engage in good old-fashioned play. Mud baths are an all-time favorite of elephants. They not only romp and play with their friends in mud baths, they also enjoy the cooling sensation and relief that mud provides from the very hot temperatures of Africa and Asia, their native homelands. Elephants in captivity also enjoy mud baths and can be seen giving their friends a helpful shove and rolling around to play in the mud. Elephants enjoy socializing with one another, as they are highly intelligent and social animals. Elephants are often seen caressing one another. They enjoy entwining trunks as if to say hello or offer a tender hug. Biologists believe that trunks may be used to greet other elephants because, through them, they can also smell the other elephant and find out more about them. 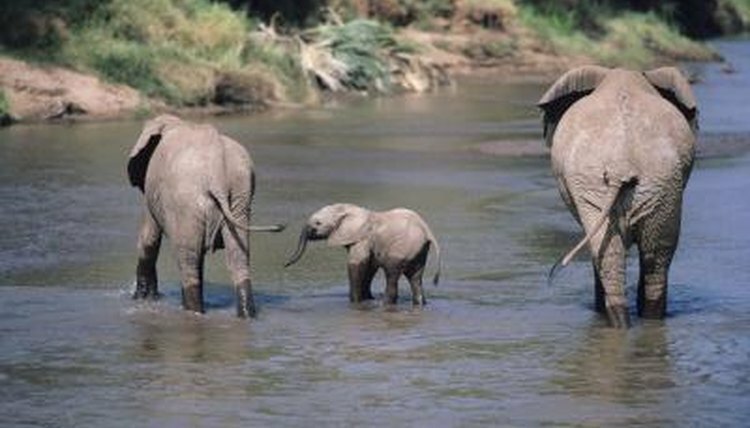 Elephants appreciate cooling off in bodies of water and may enjoy a good romp in the water with their pals. Elephants are strong swimmers, so being in the water is not unfamiliar to them. In the water, they can enjoy cooling down while "wrestling" with their friends and members of their herd. An elephant's ears also work to cool their bodies down in the heat. Elephants can be seen flapping their ears -- this works as a built-in cooling mechanism. Elephants in captivity have often been seen playing with toys that are provided to them, such as soccer balls and large beach balls. They enjoy batting the ball around with their trunks. This can prove to be hours of fun. From a young age, elephant calves enjoy running around with their friends. Literally from their calfhoods, they start down the path of forming deep bonds that will last a lifetime. African Elephants: Why do elephants use their trunks to greet each other?